Interactive whiteboards have long made their mark on the education industry. These large touchscreens have replaced archaic chalkboards in many classrooms and helped students and teachers collaborate via digital annotation. But stand-alone interactive whiteboards are becoming extinct, said Wainhouse Research analyst Alan Greenberg. The boards are morphing into a larger ecosystem of multifunctional touchscreens or virtual canvases where whiteboarding has become a feature, not a full-fledged product. These devices, and the software that runs them, are emerging in the enterprise market as they boast a range of collaboration features from digital annotation to video conferencing. 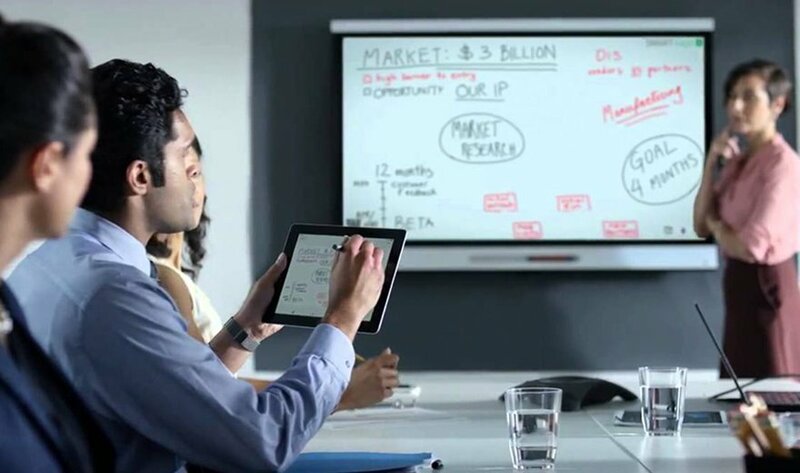 Digital annotation, the base feature for many of these products, lets users write on a whiteboard and mark up files and images with their fingertips or a stylus pen. Remote workers can view these markups in real time, and in some cases, mark up the images as well. In the world of interactive whiteboards, SMART Technologies is considered a leader in terms of market share and innovation, said Rob Arnold, a Frost & Sullivan analyst. The vendor has its roots in the education market, but also targets businesses. Up to 25% of the company's revenue comes from the enterprise side, SMART CTO Warren Barkley said. SMART offers a few interactive displays with varying capabilities. The SMART kapp iQ Pro, which runs on SMART's Meeting Pro software, is an interactive whiteboard where users can capture, save and send content. SMART's kapp iQ boards do not connect with the corporate network, Barkley said. Instead, users pair their mobile devices to the boards via a quick response code, which gleans documents and other data from the mobile device for use on the board. Remote users can also mark up the interactive whiteboard via their own devices. The simplicity of SMART's boards is a focal point, Barkley said, while other vendors offer a slew of features that might muddle collaboration. With digital annotation, he said, users want to walk up to a board, pick up a pen and simply start writing. The kapp iQ Pro features three sizes. The 75-inch model, the largest option, weighs 185 pounds and costs $9,999. SMART also offers the SMART Room System, which combines the company's interactive displays with Skype for Business and features a dual 84-inch screen configuration. Photo: The SMART kapp iQ Pro lets users contribute to the main meeting room display via their mobile devices. What added features would you need from interactive whiteboards? Basically, I think that an interactive whiteboard would just need to be relatively effortless to set up and use. We have various technologies that we could use at work, but invariably when someone wants to use a whiteboard, they grab a marker and use a regular board, because it's so convenient and easy. We end up snapping a cell phone pic of the whiteboard and sending it to remote team members. Thanks, abuell. Your feedback mirrors what vendors and analysts hear from users, who just want ease of use above all other considerations. And yes, snapping a cell phone pic of the whiteboard is pretty common. I wonder if users can always see the image clearly on their phones, though, in that circumstance.